GRT Shipping (Pvt) Ltd. Sri Lanka leading Shipping and Fishing Crew Supplier- Total shipping services provider.Crewing Agents,Shipping Agents,Chandlers,Fright Forwarders,Ship Brokers,Bunker Services,Transporters,Stevedores, crew supply for Fisshing Vessels. 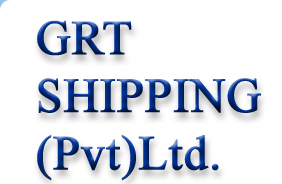 GRT Shipping (Pvt) Ltd. offers Maritime Services to all ships owners, operator and manning companies to appoint Sri Lankan crews through our management. Our agency based in Colombo Sri Lanka. We are engaged and specialized in manning of Sri Lanka seafarers onboard foreign vessels. Established to fulfill the current progressive demands of shipping industry we have maintained our database of seafarers with highly qualified marine personnel duly certified to work onboard any kind of vessel. So if you are looking for excellent crew for your vessel then contact us for our service with the terms and conditions of your company. It is our promise that we have a fruitful business relationship. Our main activity is crewing of ships (Crew recruitment & Crew manning). We would like to supply the highly qualified and experienced Sri Lankan crews (officers and ratings) with reasonable wages. We always supply the various types of foreign going merchant vessels, G.C, Container, Bulk carrier, and also bunker, supply boats and towing tugs and off shore crews. Every crew is holding the travelling documents and nautical documents (certificates according to the STCW 95 requirements and C.D.C. books) issued by M.O.T & D.M.A and registered at S.E.C.D (Seaman Employment Control Division). They can join ships in time anywhere. We are looking forward to your reply (info@grtshipping.com). Whilst operating with us, it will be mutually beneficial for among us safety crewing you need only one crew supplier when working with our services.